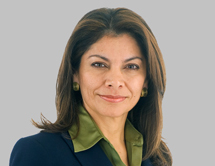 Laura Chinchilla Miranda was elected president of Costa Rica in 2010 and sworn in as President on May 8, 2010. She is the nation’s first female president. A graduate of the University of Costa Rica, she received a Masters in public policy from Georgetown University. She went on to work as a consultant on judicial reform and public security traveling in Latin America and Africa. Her public career has included service as a deputy in Costa Rica's national assembly. She was also first Vice President of the Republic and Minister of Justice in the administration of Óscar Arias Sánchez. A social conservative and free trade advocate Chinchilla is also a strong environmentalist, continuing the previous government’s work to combat climate change and promote sustainable ecotourism. On March 3, 2011 President Chinchilla signed an executive decree establishing a new 2,900 square miles marine reserve around the world-famous Cocos Island National Park. This new "Hope Spot" in the sea is the second largest protected marine area in the eastern Pacific after the Galapagos Islands. It reflects Costa Rica's ongoing commitment to being a good steward of its two coastlines and oceans.